Back to you, news cycle. Well, this news does make me miss those good old days when that idiot tool was going to be the worst-ever President in my lifetime . . .
Good for the third-worst President after Trump and Nixon. Honestly, Andrew Jackson and Ronald Reagan should rank well above W. I hate W, don't get me wrong, but he didn't have a genocidal policy towards the AIDs crisis in the same way Reagan did and he didn't actively go around murdering first nations people, like Andrew Jackson did. He's absolutely one of the worst presidents, but, like, he's at least fifth worst behind Jackson, Reagan, Trump, and Nixon (in that order). Good for shrub. A hole-in-one makes any golfer's year. For a duffer, it's superb. 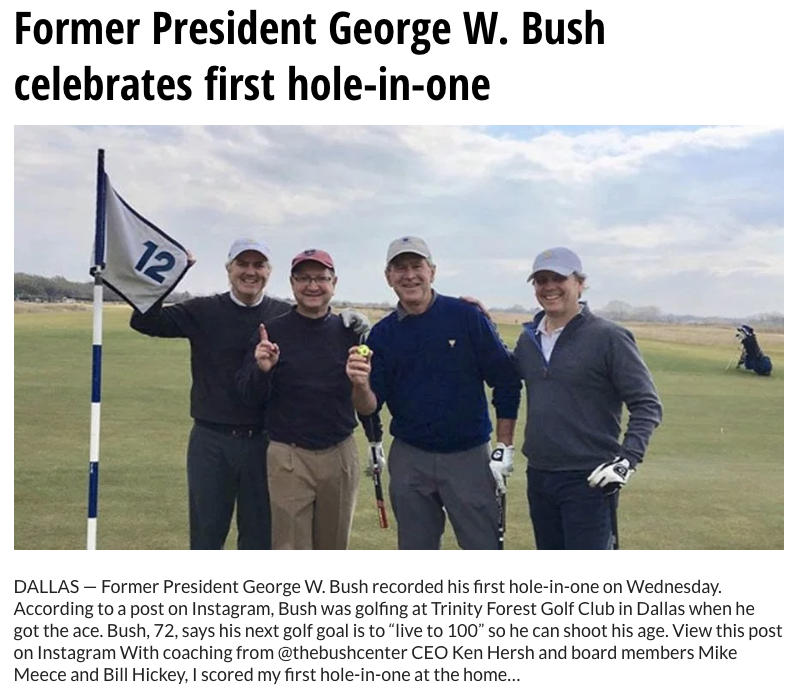 How many holes in one does Trump have? Hope he wore two pairs of pants.